In November 1919 Major F W H Blake took over as Governor from Major Davies who had remained in post since 1905 (the second longest serving governor). Major Blake had been a previous Deputy Governor, and appeared to be delighted to be back. Apart from Robert Hosking, Blake is my favourite Governor both for his wit and his passion for Pentonville. Unfortunately he had a very terse style and recorded only the minimum of information. Such entries as he did make should then be seen as significant. There are the regular entries i.e. receptions, discharges and total at unlock each day. The roll when he took over was 785. It is also evident that the Governor was still expected to attend the Divine Service each Sunday (or explain his absence), to undertake weekly night visits, monthly cash checks, monthly store checks, and to attend all floggings and hangings. In fact in this 8 year period, only seven floggings are recorded (all awarded by the courts except for one awarded by the VC) and only 17 executions. This was a period of low population in the prison, the roll averaging about 700. The number of deaths in custody was also much lower, totalling eleven in all from natural causes. The number of suicides had increased to 5 in all with 4 other serious attempts recorded. It remained common practice during this period to use the loose canvas restraint jacket on all those demonstrating a suicidal tendency. The speed of the formal Inquest after each death was still in place, being held usually within 3 days. For executions the Inquest would be held the same day. What follows is a chronology of significant events in the life of Pentonville between 1919-1927 to give a flavour of life at Pentonville by selecting pertinent extracts and therefore seeing the prison through the Governor's eyes. Tuesday 11 November 1919. By command of the King, all work ceased from 11.00 - 11.02, Armistice Day. 22 November. Captain Roberts - Deputy Governor reported for duty. Sunday 4 January 1920. Inadvertently prevented from attending Chapel, but I was in the prison. 5 January 1920. I proceed on 3 days (well earned) leave of absence, leaving prison in charge of the D/G. I trust I find it in Caledonian Road on my return. 3 February 1920. I attended a conference at Headquarters re the Whitley Scheme as applicable to Gaols. 24 April 1920. The Bishop of Stepney dedicated the organ and credo and preached at the afternoon service. 2 May 1920. Foreign Section of GPO Choral Society sang to the prisoners at the afternoon service. 9 May 1920. Officers of the Church Army Ladies gave a rendering of songs and choruses at afternoon service. 27 May 1920. Attended Wormwood Scrubs Prison in the afternoon to elect Representatives for the Superior Officers Representative Board. To put this reference into perspective it should be noted that there were no staff associations at this time. The early 1900s, were not conducive to the establishment or development of trade unions or staff associations. Legal cases had damaged the union movement, high unemployment made jobs difficult to get, and those in employment were not going to risk losing them by joining unions when employers were opposed. The war years had diverted people's priorities. The question of a union for prison officers was raised in Parliament in March 1906. The Home Secretary was asked about alleged grievances of warders and whether they could have the right to a `federation'. He replied he was not aware of any grievances and deferred a decision. The same point was raised again in May 1908 but went unanswered. In spite of this the Prison Officers Magazine was founded in 1910 and was edited from outside the Service. Churchill's reformative zeal on behalf of the prisoners had no counterpart in his handling of staff concerns. Prison Officers he ruled, were like policemen, soldiers and sailors, it was inappropriate for them to form unions. In 1915 the `underground' Prison Officers Federation' was formed. This created some conflict as a number of staff had earlier in 1913 formed a National Union of Police and Prison Officers (NUPPO). There was particularly strong support for NUPPO at Pentonville, where officer/clerk Renshaw was on the executive committee. The war years were a set back for the Prison Officers Federation, with the majority of staff being unwilling to join. By the end of the war it was formally announced that the Federation would amalgamate with NUPPO. The success of NUPPO was short lived. In 1919 the Police Act was passed which forbade police officers to join a union. NUPPO responded by calling a strike in August. Everybody who took part was instantly dismissed, including 68 officers from Wormwood Scrubs and 6 from Birmingham. This caused huge resentment, but they were never reinstated, even by the Labour Government. The government tried to placate the anger of both police and prison officers, but setting up consultative machinery in the form of a Police Federation, and a Prison Officers Representative Board (PORB). This was resented and attacked by the hard line of Prison Officers Federation. For twenty years the PORB was the official channel of communication between the officers and the Commissioners. It was attacked persistently by the officers magazine. It was also widely criticised because it was too closely identified with the Commissioners. It lacked independence of action as there was no full time officials to organise it. It was pointed out that `representatives' of Wormwood Scrubs opposed the reinstatement of the strikers. It was not until 1938 that officers were given permission to form the Prison Officers Association. 23 October 1920. 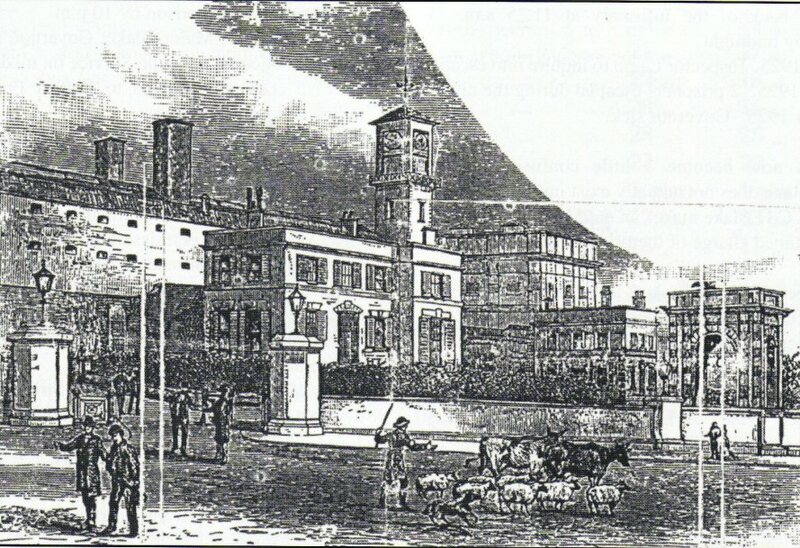 The Pentonville Officers Club was opened. The Chaplain preached from the text `say when' but forgot to carry out his text. 21 November 1920. The Highbury Orchestral Society gave a concert in the afternoon and had the Bass Viol played in the same key as the other instruments no doubt the effect would have been delightful. 5 December 1920. The Church Army Mission ended a week's disturbance of Prison Regime. 25 December 1920. There was a more or less Sacred Concert in the afternoon. 10 January 1921. I endeavoured to make at night visit at 12 midnight, but as another result of inefficient Gatekeeper, could not get into the prison! The next entry came as a surprise and I have been unable to place it in any kind of context. 29 January 1921. Returned on time. 14 November 1921. The Secretary of State unveiled the War Memorial at 3.30 p.m..
20 November 1921. The Fox Film Co presented the Film `Over the Hill' in the afternoon. 27 November 1921. The Church Army commenced an 8 day mission. I refrain from comment. 31 December 1921. I unlocked the prison at 10.30 p.m.. to admit the extradited convict Kilby from Spain. 15 January 1922. Prevented from attending Chapel owing to severe cold, for same reason not making a night visit this week. 12 February 1922. Governor being threatened with influenza and feeling generally rotten has mainly done office work. 13 February 1922. Governor feeling similar to yesterday has allowed the D/G to do most of the work (as usual). 23 February 1922. Col Knox inspection until 25/2. 2 April 1922. Owing to attack of neuritis I have made no night visit this week. 14 April 1922. It being Good Friday, Divine Service held morning and afternoon. 7 May 1922. Owing to a severe cold coupled with a churchyard cough I have not been able to make a night visit last week (advice of MO `avoid night air'). 6 September 1922. Col Knox inspection x 2 days. 12 November 1922. Governor attended a conference at the Garrick Club, Mr Gilbert Hair in the chair. 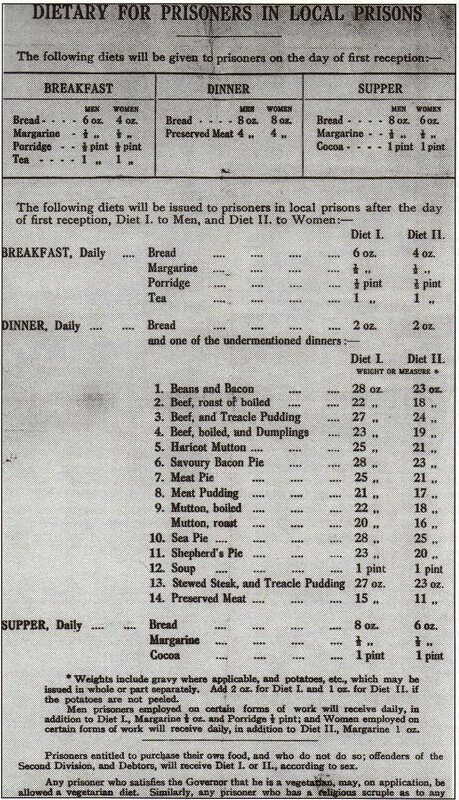 Various prison matters and 1809 Brandy was discussed and Conference broke up at 11.45. Governor in spite of the above made a night visit at 12.30 a.m..
17 December 1922. The Bishop of London preached in the afternoon. He entered the Chapel proceeded by the Rev Payne who apparently was taking the part of Little-Bo-Peep. 5 July 1923. The Governor returned bronzed and beautiful from 10 days leave. 16 September 1923. A collection of freaks made a noise in the Chapel called by the Chaplain `a Sacred Concert'! 6 October 1923. I visited the prison at the witching hour of midnight when gaolers yawn and I want to be in bed. 22 October 1923. Ever vigilant, the conscientious and untiring Governor visited the prison at 12.10, thereby putting to shame the unblushing Deputy Governor who makes his night visits the instant the clock has struck 11 p.m..
11 November 1923. Divine Service in the morning. Concert in celebration of Armistice Day in afternoon. 19 November 1923. Colonel Knox - Inspection. 25 November 1923. In the afternoon the Salvation Army Band gave what they called `Home in Heaven' (give me London!). 3 December 1923. Governor and Deputy Governor attended a meeting of more or less Prison Governors at the Home Office (tea and mixed biscuits 5 p.m..). 4 December 1923. The meeting at the Home Office continued and we returned with improved minds and more hopeful outlook at 3 p.m..
1 January 1924. Unlock 649. 7 February 1924. Governor proceeded on 21 days leave `kindly' granted by the Commissioners. 14 February 1924. Mr M L Waller C.B. Chairman of the Prison Commission visited. 1 March 1924. Unlock 599. Having lost 117 prisoners during my absence, the D/G handed over my depleted stock yesterday. 28 March 1924 E Taylor escaped from outside party at 3.45 p.m..
30 March 1924. Taylor (escaper) recaptured at Aylesbury and escorted to Pentonville. 31 March 1924. I go on 21 days sick leave tomorrow leaving prison, D/G i.e. 22 April 1924. Governor on further 14 days sick. 20 May 1924. This day marks the fact that 60 Summers (if you call them summers) have wafted over the Governor's head, removing the hair thereon as they wafted and whitening what remained. 3 July 1924. I proceed tomorrow to go on 3 weeks annual leave, and have permission to sleep away from quarters tonight. 22 August 1924. I visited the Home Office with a Deputation of Officers seeking the blood of the `Evening News' which had vilified the `Peerless Purity of Priceless Pentonville'. 2 November 1924. The Bowes Park Choir (55 in number) made noises in the afternoon. 11 November 1924. Armistice Day Service was held in the RC, CE Chapels and the Synagogue. D/G made a night visit after our Armistice Ball, at 12 midnight! 29 November 1924. In the evening a dinner was held in London for beloved Commissioner Mr John Farwell in order to persuade him to think better of his threat to retire. The Commissioners, Colonel Knox, one super Governor, and the Class I Governors and one super Deputy Governor were present `Gaolers Feed'. I visited the prison at 12.42 and got the pass key into the key hole in one!! 15 February 1925. Colonel Knox Commissioner visited to enquire into statements made by one Stanley Fox against 2 officers. 19 May 1925. Investigation continues. 21 May 1925. Colonel Knox spent a pleasant afternoon listening to the World's Worst Liars. 23 May 1925. Governor on special duty at Camp Hill until 2 July 1925. 31 August 1925. Mr A Patterson, Prison Commissioner visited the prison. 1 September 1925. Home Secretary visited the prison p.m..
9 September 1925. Marks received 10 strokes with the birch awarded by VC. 7 October 1925. 2 prisoners escaped by climbing the wall at the back of the Infirmary at 11.25 a.m.. 1 recaptured by midnight. 12 October 1925. Inspector Lamb to inquire into escape. 18 October 1925. 2 prisoners escaped during the night. 6 November 1925. Governor sick. The entries now become a little confusing as the Governor Blake does not actually exist until April 1926, but Major A C H Blake makes an entry on 12 November 1925, `I assumed charge of the prison' and signed it. 17 November 1925. Checked arms and ammunition. Tested Execution Apparatus and found it satisfactory. 1 and 2 December 1925. Attended with D/G Governors Annual Meeting at HQ. CO in charge. 25 December 1925. Unlocked 681. 29 December 1925. A Locke removed to St Mary Hospital for operation - Temporary Release. 16 January 1926. Suicide by hanging. 19 January 1926. Inquest `suicide while of unsound mind' Rider. Jurors of the opinion the action of prison officers were in every way satisfactory. 24 January 1926. After the Chapel Service certain prisoners created a disorder by hissing and booing. I addressed the men and told them they must deal with their applications and grievances at the Orderly Room. After a time, quietness was obtained and they marched out in an orderly manner. 25 January 1926. 43 Applications specially dealt with at Orderly Room, and in company of D/G I attended Head Office to report to the Commissioners fully on recent events and yesterday's disorder. 26 January 1926. Colonel Knox attended this day to receive application from prisoners. All prisoners confined to their cells by Commissioners instructions. Exercise was carried out during the day. 29 January 1926. 22 men were specially transferred under the Commissioners Orders - Birmingham 6, Norwich 4, Oxford 4, Portsmouth 4, Bedford 4. 30 January 1926. 12 men specially moved by Commissioners Orders - Exeter 3, Shepton Mallet 3, Dorchester 2, Bristol 4. 31 January 1926. Special arrangements were made for services and exercise and passed off successfully. 1 February 1926. Major Goldie Taubman attended and presented ISM to PO Fordon. 13 February 1926. John Lewis forcibly fed by MO. 15 February 1926. The prison was specially opened at 11.45 p.m.. to admit relatives of Stansfield who is lying seriously ill in hospital. These relatives have specially travelled from Nice (France). 16 February 1926. Stansfield (seriously ill) discharged to Brompton Hospital to care of mother under order of the Secretary of State. 1 March 1926. HRH Duke of York visited the prison this day and made a tour of inspection accompanied by Colonel Knox. 9 March 1926. Opened the prison at 10.25 p.m.. to admit officers Walton and Pickering to their rooms. Warned they must be in the prison by 10 p.m..
11 March 1926. Major Blake, Governor, received one month's notice to leave the Service on medical grounds. 12 Irish convicts removed to Belfast Prison by Irish Police and prison officers. 20 March 1926. Bishop of Stepney visited De Vere under sentence of death. Preached at morning service. 10 April 1926. Fingerprints of 3443 Murphy taken by force under Head Office instructions. 4 May 1926. Gave permission for the prison to remain open until 11 p.m.. instead of 10 p.m.. during the General Strike to assist officers sleeping in. 6 May 1926. George Day attempted suicide by cutting his throat and was placed in loose canvas restraint jacket by Medical Officer. 8 May 1926. Owing to the General Strike and additional evening work I have done no night visit this week. 1 June 1926. The Chairman Mr Waller, visited the prison today with 5 Government Officials from Japan. 1 June 1926. Served a notice on the daughter of late officer Roberts to quit the quarters in Roman Road at 9 a.m.. on 7 June. 23 October 1926. Charles Brown was released by Order of the Secretary of State but remained overnight at his request. 2 November 1926. Execution of Samandar. Inquest `Dislocation of CV by hanging'. Two mullahs were admitted to wash and deal with body after execution. 11 November 1926. Special Armistice held in all chapels. 5 officers attended Cenotaph. 1 December 1926. Attended Governors conference at Headquarters. 2 December 1926. Lecture given in evening to all prisoners who had 6 months good conduct. 14 December 1926. Unlock 820. Transferred 54 special class to Wandsworth Prison. 15 December 1926. Transferred 20 to Maidstone to prevent overcrowding. 7 January 1927. Stoller forcibly fed today for refusing to take his food since the evening of 5 inst. Case reported to the Commissioners. 13 April 1927. The bones and iron chains sent from the Prison Commissioners which had been excavated at Newgate some years ago, were buried this morning near the Execution Shed. 10 May 1927. Temporarily closed officers club owing to the insulting behaviour of member or members. 13 May 1927. Mr Waller, Chairman of the Prison Commission visited. 11 June 1927. Prison remained open until 10.40 p.m.. for purpose of telephoning re Chief Officer who is seriously ill.
13 June 1927. Chief Officer Weatherhogg died this day whilst on annual leave. 15 June 1927. Attended CO Weatherhogg's funeral at Boston, Lincs, with PO Middleton. It comes through very strongly how much Major Blake was proud to be Governor at Pentonville, how he detested night visits even more so than his predecessors, and is the first Governor to demonstrate some question over the role of the Chaplain, and particularly `Missions' and a deep scepticism over concert parties. Ill health got the better of him in the end, and it is clear he was pensioned off and did not relinquish his post voluntarily. What he did bring to the role was a sense of realism and a keen wit. Still prerequisites for the role of Governor. Finally the events of January 1926 after the Chapel Service were in their way a pre-cursor of Manchester in 1990. A timely reminder that staff in Penal Establishments have to be ever vigilant. I would have been proud to serve under Major Blake.